Fresh, colorful indoor blooming plants make wonderful accents in home and office spaces. With fresh deliveries every week, our plants and flowers—from popular indoor plants to vibrant exotics to hardy succulents—liven up any space. Search by growing environment or size for more specific results. Please call to see if your favorites are currently in stock. The African violet, known botanically as Saintpaulia, is one of the most popular flowering houseplants. African violets are easy to grow for the beginning gardener, yet offer a wide range of cultivars to satisfy the serious grower. African violets adapt well to typical growing conditions found in the home. Because of their small stature, they also adapt well to limited space gardens such as those in apartments with just a few windowsills. Many cultivars of African violets are available, ranging from miniatures (plants 6 inches or less in diameter) to large (over 16 inches in diameter). Flowers come in blue, purple, lavender, pink, red, and white as well as bicolored and multi-colored forms. Flower shapes also vary from single, star-shaped blooms to double, semidouble, fringed, and ruffled. Even the leaves come in different types, including ruffled, scalloped, quilted, and variegated. LIGHTING REQUIREMENTS: African Violet houseplants do best and flower more in bright indirect light, close to an east-facing window is ideal. When the light is too low, the leaves of African Violet Plants turn dark green, lose their plump appearance, and produce very few flowers. The leaves of African Violet Plants turn a pale yellow-green and the flowers fade quickly when there is too much light. CARE INSTRUCTIONS WATER: Allow the top 1"- 2" of soil to dry out before watering an African Violet plant. Avoid using water that has passed through a softener or water containing chlorine or fluoride. Always water African Violet houseplants from the bottom to prevent water getting on the leaves. Remove any excess water that is still in the saucer after 15 minutes. FERTILIZER: Special fertilizer for African Violet houseplants is available wherever plants are sold. In a pinch, you use any balanced, soluble, houseplant food at 1/2 the recommended strength. Fertilize African Violet Plants monthly when the plant is actively growing. Over-fertilizing causes leaf tip burn, poor flower production, leaf cracks, and may even kill an African Violet Plant. TEMPERATURE: African Violets do well in temperatures 75-80 degrees during the day and about 10 degrees cooler at night. 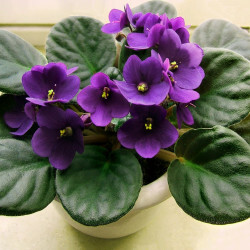 Keep African Violet Plants away from cold drafts and heating vents. HUMIDITY: High humidity is preferable, but African Violets easily adapt to basic household humidity. FLOWERING: Quickly removing dead blooms and stems from African Violet Plants encourages flower growth. Keeping the soil of African Violet houseplants on the dry side helps the plant bloom more often. PESTS: Sspider mites and Mealy Bugs are two houseplant pests that attack African Violet Plants. Use a Qtip dipped in alcohol or Neem Oil to treat these insects as soon as they appear. Since the leaves of African Violet Plants are easily damaged, only use commercial insecticides that are recommended for African Violets. DISEASES: African Violet houseplants are susceptible to botrytis, powdery mildew, and Erwinia Blight. Preventing African Violet Plants from getting these diseases is easier than treating the diseases once they appear. Providing good air circulation around African Violet Plants and never getting water on the leaves helps prevent diseases. SOIL: African Violet Plants like a rich, airy, potting medium. Special African Violet soil is available at most garden centers. African Violets should be re-potted every 6-12 months using fresh soil to prevent unwanted salt build-up. This particular Anthurium is a hybrid of the species Andreanum and is a herbaceous epiphyte indigenous to Tropical America. The Greek translation of Anthurium is “tail flower” and it is also know as Flamingo Lily. The spathe is the waxy, modified leaf that forms the heart shape of the flower and spadix is the “tail” where the actual flowers emerge. The spathe comes in three varieties – standard (the quintessential heart-shape), obake (“green ears”), and tulip (tear-drop shape). LIGHTING REQUIREMENTS: Anthurium Houseplants likes as much bright indirect light as possible, but no direct sun. If there is insufficient light, Anthurium HousePlants produce fewer flowers and the leaves stretch toward the light. CARE INSTRUCTIONS WATER: Water Anthurium HousePlants well and then allow the top two or three inches of soil to dry out before watering again. Over-watering causes yellow leaf tips on Anthurium HousePlants, under- watering causes brown leaf tips on Anthurium Plants. FERTILIZER: Use a balanced fertilizer or one a little high in nitrogen for Anthurium HousePlants. Feed Anthurium Plants monthly in the spring and summer, when they are actively growing. When fertilizing Anthurium HousePlants, always dilute the plant food 1/3 to 1/4 the recommended strength. TEMPERATURE: Anthurium House Plants prefer temperatures between 75-85 degrees during the day and about 10 degrees cooler at night. Temperatures below 50 degrees slow the growth of both leaves and flowers on Anthurium HousePlants. HUMIDITY: The higher the humidity the better Anthurium HousePlants grow. FLOWERING: Quickly remove the fading or dying flower spathes on Anthurium HousePlants as soon as they appear. PESTS: Anthurium Plants are susceptible to many houseplant pests such as: Mealy Bugs, scale, Aphids, and thrip. The new tender growth on Anthurium Plants is especially vulnerable to these plant insects. Examine your Anthurium Plants carefully ever time you water and spray with the green solution if you notice any plant pests. DISEASES: Fungal and Bacterial plant diseases are a problem for Anthurium House Plants because of the high humidity and warmth that Anthurium Plants require. Keeping water off the leaves and providing good air circulation around Anthurium House Plants is a good way to prevent plant diseases. SOIL: Use a rich, organic, loose potting soil that contains some mulch and sphagnum moss for Anthurium HousePlants. The soil of Anthurium Planst needs to drain quickly so you may have to add some sand to the mix. If you’re tired of buying expensive cut flower arrangements for your dining room table or the reception desk in your office, think about using Bromeliad Plants. There are over 2500 species of Bromeliad Plants that are native to North, Central and South America. My favorites Bromeliads are: Neoregelia, Aechmea, and Guzmania. Bromeliad Plants have spectacular flowers, which are really “bracts” that stay colorful for 6-10 weeks. There are numerous varieties of Bromeliad Plants to choose from all with different leaf colors and shapes. The exotic looking Bromeliad bracts come in red, burgundy, pink, white, yellow, orange, and even a mixture of colors. Use a single Bromeliad Plant or combine three different Bromeliad Plants to create your own special arrangement. A Bromeliad will only bloom once indoors, then it’s necessary to start a new plant using cuttings from the original plant. LIGHTING REQUIREMENTS: Bromeliad Plants are very adaptable, and there is a variety for every light condition. If your Bromeliad Plant has thin green leaves it can survive in low light. If a Bromeliad Plant has thick gray leaves, it needs medium light. The flowers (colorful “bracts”) of a Bromeliad Plant fade quickly and the leaves turn pale green if a Bromeliad Plant is placed in very bright light. The leaves of a Bromeliad Plant get further apart and turn dark green when the plant needs more light. CARE INSTRUCTIONS WATER: Bromeliad Plants are drought resistant succulents that like dry soil. These houseplants have very small roots and over-watering is the number one reason Bromeliad Plants die. FERTILIZER: Feed Bromeliad Plants by spraying a liquid fertilizer directly onto the leaves a few times each season. Dilute the plant food 1/2 to 1/4 the recommended strength. Never put fertilizer into the central cup of a Bromeliad Plant. TEMPERATURE: Bromeliads are tropical plants that can survive in temperatures between 40-100 degrees, but these plants prefer 70-75 degrees during the day and ten degrees cooler at night. The blooms on Bromeliad houseplants last longer when the temperature is cool. HUMIDITY: Bromeliad Plants grow well in basic household humidity. FLOWERING: Less intense light and cooler temperatures help the flowers on Bromeliad houseplants stay colorful longer. Indoor Bromeliad Plants bloom one time. Once a Bromeliad flower starts to die, it begins to produce “pups.” These pups will be the new Bromeliad Plants. Cut off the dying flower, so the plant can direct its energy to helping the pups grow. PESTS: Plant pests that can be a problem for Bromeliad Plants are scale and mealy bug. DISEASES: Fungal plant diseases such as Crown, Stem and Root Rot, Rust Disease, and Leaf Spot may infect Bromeliad Guzmania houseplants. SOIL: Use a light well-aerated fast draining soil for a Bromeliad Guzmania. Add sand or perlite if the soil seems too heavy. A Chrysanthemum is really an outdoor plant that has become a popular floral gift and flowering plant for home and office. It is second only to the rose as the most popular cut flower in the world. Mums are members of the Asteraceae Family which includes over 20,000 flowering species. Chrysanthemums were brought to Japan by Buddhist Monks in 400 AD and have remained a very important part of Japanese culture to this day. Mums last 3-4 weeks indoors with very little care and in almost any environment before needing to be replaced. The blooms which come in various shapes and colors can be daisy-like, pom-poms, or buttons, and may be yellow, burgundy, pink, or white. NASA has listed the Chrysanthemum as a plant that cleans the air of benzene, formaldehyde, and carbon monoxide. You may also enjoy sipping Chrysanthemum tea to relax. LIGHTING REQUIREMENTS: Mums stay in bloom longer when placed in medium light and away from heating vents, air conditioners, and direct sun. CARE INSTRUCTIONS WATER: Mums last longer as an indoor plant if you allow the top few inches of soil to dry out a little before you water. You can even let the green leaves become soft and droopy before watering. FERTILIZER: Indoor mums do not need to be fertilized because they only last about six weeks. TEMPERATURE: Cool temperatures help the blooms on a Mum last longer and high temperatures cause the blooms to quickly fade. 70 degrees during the day and not below 60 degrees at night are best for a Mum. HUMIDITY: Mums last longer and grow better in high humidity but will do fine in basic household humidity. 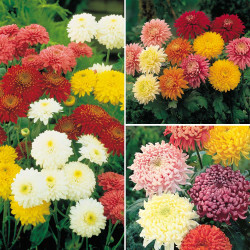 FLOWERING: There are two different kinds of Chrysanthemum plants, florist Mums and winter hardy fall Mums. Florist Mums don’t do well when planted outside; you can try but don’t blame yourself if they die. If you’ve been enjoying a winter hardy Mum indoors, once the blooms die you can cut the plant back to 4”-5” above the soil line and plant it outside. It is almost impossible to get a Mum to bloom again indoors. PESTS: Watch out for Aphids and thrips. SOIL: Use a rich fast-draining slightly acidic soil. Freesia is a genus of about 14 species. Freesia bulbs are usually grown for use as Cut Flowers. All the 14 species of Freesia are African in origin. Of The 14 Freesia species, 12 are native to Cape Province, South Africa, the remaining two to tropical Africa, with one these species extending north of the equator to Sudan. Freesia flowers are very fragrant, typically white or yellow, and are borne in spikelike racemes. This blooming beauty captures your heart and is a springtime favorite. LIGHTING REQUIREMENTS: Indoors, position your Freesia where it will get the maximum sun available. CARE INSTRUCTIONS WATER: Water freesia about 1 inch every week during the growth and blooming periods. FERTILIZER: Fertilize freesia with 12-4-8 fertilizer and water more frequently when the plant begins growing again during the next season. TEMPERATURE: Freesias bloom best when night time temperatures remain below 50°. 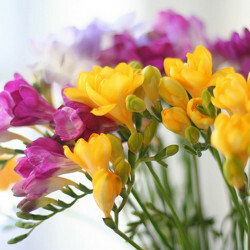 In cooler regions, Freesias should be planted in mid-spring, after all danger of frost has passed. HUMIDITY: Freesia prefer high humidity but will do fine in basic household humidity. FLOWERING: Do not remove the foliage until it has died back naturally, to allow the leaves to store energy for next years show. In areas where Freesias are hardy, the clumps can be left undisturbed for 3 years before dividing. In cold climates, the corms will need to be dug after the foliage turns brown, and stored in a cool, dry area until next spring. PESTS: Watch out for Aphids and thrips. SOIL: Use a rich fast-draining slightly acidic soil. Kalanchoe Houseplants, native to Madagascar, are easy-care, flowering succulent plants that do extremely well indoors. Kalanchoes, a relative of the Jade Plant, are short, bushy, upright plants with thick, oval-shaped scalloped leaves. A Kalanchoe Plant’s long-lasting star-like blooms appear in clusters at the ends of sturdy stems. The vibrant colored flowers of Kalanchoe houseplants come in red, orange, yellow, lavender, white, and pink. Some new varieties of Kalanchoes even have bi-colored flowers. Kalanchoes are great houseplants to perk up your home during the long winter months. The shorter the days, the more flowers Kalanchoes produce. Best of all, the blooms on Kalanchoe Plants may last up to 8 weeks. LIGHTING REQUIREMENTS: Kalanchoe Houseplants need bright indirect light and enjoy direct sun during the fall, winter, and spring. Direct sun in the summer is too intense and burns the Kalanchoe leaves. The blooms on Kalanchoe Plants are photo-periodically induced. As the days get shorter and Kalanchoe Houseplants experience longer periods of darkness, they produce more flowers. CARE INSTRUCTIONS WATER: Kalanchoe houseplants are Succulent Plants with plump leaves that store water for long periods of time. Kalanchoes are easily over-watered which causes root-rot. Allow the top 50% of the soil of Kalanchoe Houseplants to dry-out before watering. If the soil of a Kalanchoe Plant is exceptionally dry, sit the plant in a deep saucer filled with water for about ten minutes. This not only prevents over-watering but also prevents water from dripping on Kalanchoe plant leaves and causing plant diseases such as leaf spot or powdery mildew. FERTILIZER: Fertilize Kalanchoe houseplants monthly, when it is actively growing, with a plant food high in nitrogen diluted to 1/2 the recommended strength. If the soil of the Kalanchoe is very dry, moisten the soil with plain water before using water containing plant food. This prevents the fertilizer from burning the roots of the plant. TEMPERATURE: Kalanchoe houseplants like warm temperatures between 60-85 degrees. Low temperatures of 40 degrees or less will damage or kill a Kalanchoe plant within a few hours. Always keep Kalanchoes away from cold drafts and open windows during the winter. HUMIDITY: Kalanchoe Houseplants grow well in regular or low household humidity. When the humidity is too high, Kalanchoes develop plant diseases such as leaf spot or powdery mildew. FLOWERING: Remove faded blooms from Kalanchoes houseplants as soon as they appear to encourage more flowers. Starting in October, keep a Kalanchoe plant in total darkness for up to 14 hours a day and then place it in bright indirect light the rest of the time. This forces them to bloom exactly when you want. PESTS: Indoors, Kalanchoe plants are fairly pest resistant. When placed outdoors for the summer, Kalanchoe Plants attract mites, scale, and Aphids. 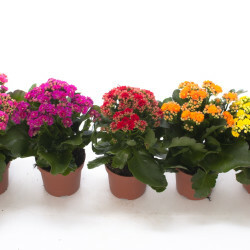 Kalanchoe Plants are very sensitive to chemical insecticides. When treating Kalanchoe Plants for a plant pest infestation, use the green solution, yellow sticky cards, insecticidal soap, or Neem Oil. DISEASES: As mentioned earlier, Kalanchoe plants are prone to fungal leaf spot and powdery mildew. The best way to prevent these plant diseases is to keep Kalanchoe leaves dry and provide good air circulation. SOIL: Use a light soil composed of peat moss, sand, and perlite that drains well for Kalanchoe houseplants. When using a basic store bought potting soil, be sure to add an equal amount of sand. Miniature roses are perfectly scaled, smaller versions of larger roses, with all the colors, forms, substance, and often, fragrance of full-sized roses. Like other types of roses, each variety of miniature rose has different characteristics, with plant size ranging between 6 inches and 4 feet or more and plant shapes that include bushy, compact, climbing, and cascading. No matter what the shape or growth habit, a good miniature rose has flowers and leaves in perfect proportion. Smaller definitely doesn’t mean less attractive, and in most cases, smaller does mean easier to grow. Their smaller habit makes miniatures ideal for growing in containers. The flowers provide bright and constant spots of color throughout the growing season, and you can cut their flowers for mini-bouquets and arrangements. The selection of varieties is awesome, and hundreds of new ones are introduced each year. 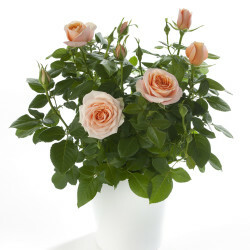 LIGHTING REQUIREMENTS: A Miniature Rose Plant needs very bright light in order to grow. If you don’t have a place where the Rose Plant gets several hours of direct sunlight, try moving it outdoors into the sun for a while each day once the danger of a frost is over. When there is insufficient light, Miniature Roses don’t bloom, the stems start to stretch, and the plant becomes thin. CARE INSTRUCTIONS WATER: Miniature Roses require a great deal of water, especially when they are flowering. Since Miniature Rose plants are usually purchased in a small pot, be sure to check the soil every few days. Allow the top 1” (2.5cm) of soil in a Miniature Rose Plant to dry out before watering. During the winter, when a Miniature Rose is resting, keep the soil barely moist. Be careful not to get water on the leaves of a Miniature Rose Plant since this causes a fungus called black spot. FERTILIZER: Feed a Miniature Rose Plant every two weeks in the spring and summer when it is actively growing. Use a fertilizer that is high in phosphorous (5-10-5) at ½ the recommended strength. TEMPERATURE: Miniature Rose Plants do well in temperatures between 60-75 degrees (16-24 degrees C). Roses planted in containers are very susceptible to frost. HUMIDITY: Miniature Rose Plants need moderate to high humidity. If your home is dry, especially in the winter, place a Miniature Rose Plant on a tray of wet pebbles. Be sure the plant is sitting on the pebbles and not in the water. FLOWERING: Remove dead blooms from a Miniature Rose Plant as soon as they appear, this helps the plant bloom for a longer period of time. Always use a sharp pruner or scissors to cut the flowers off a Miniature Rose Plant, never just pull them off with your fingers. Tearing the stems of a Miniature Rose Plant, rather than cutting them at a 45-degree angle, damages the stem and encourages diseases. Once the plant finishes blooming and the weather warms up, move your Miniature Rose outdoors. Be sure to bring a Miniature Rose Plant back inside once the temperature goes below freezing. PESTS: spider mite and Mealy Bugs are two houseplant pests that can infest an indoor Miniature Rose Plant. Rinse a Miniature Rose Plant once a week with a mild soapy water solution to help prevent infestations and keep the plant dust-free. DISEASES: If kept too damp, Miniature Rose Plants, like their bigger cousins, develop a fungal plant disease called black spot. Immediately remove the infected leaves and treat your Miniature Rose Plant with a Fungicide recommended for black spot disease. Orchid Plants are one of the largest plant species in the world with over 20,000 different varieties. Orchid Plants are long-lived, and, with proper care, bloom again and again for many years. The flowers of an Orchid Plant may be yellow, white, pink, lavender, spotted, or stripped. Orchid Plants are a beautiful inexpensive replacement for a cut flower arrangement, or just an added delight for any room in your home or office. 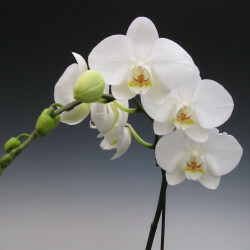 The Phalaenopsis, or Moth Orchid, is one of the best and most easily available Orchid varieties. The flowers of a Phalaenopsis open off a long arching spike and often last 2-3 months. LIGHTING REQUIREMENTS: There is an Orchid Plant to suit almost any lighting condition, but none like being in the direct sun. If an area is too dark, the leaves of an Orchid Plant turn dark green instead of the grassy yellow green they should be and the Orchid plant doesn't bloom. If there is too much light, the leaves of an Orchid Plant turn yellow and develop sunspots. A location near an east or west facing window is usually best location for a Phaleonopsis Orchid. Most Orchid Plants prefer about 10 hours of light a day. CARE INSTRUCTIONS WATER: The easiest way to kill any Orchid Plant is by over-watering. Always allow the top 50% of the potting compost to dry out before watering. Check the roots of an Orchid Plant monthly to be sure they are staying whitish green and plump. Never allow an Orchid Plant to sit in water and keep water off of the flowers. Never use water from a softener on an Orchid Plant. Soil, temperature, time of year, humidity, and pot size all influence an Orchid Plant's watering needs. Orchid Plants dry out a little faster in the winter because of the heat in your home and low humidity. FERTILIZER: Fertilize every two weeks while an Orchid Plant is actively growing. No not feed an Orchid Plant when it is dormant or when the plant is in bloom. There are excellent Orchid Plant foods on the market. You can also use a well- balanced houseplant food at 1/2 the recommended strength to fertilize Orchid Plants. TEMPERATURE: Orchid Plants do well when the temperature is 65-80 degrees during the day and 15 degrees cooler at night. In the fall, the cool night temperatures help the flower spikes of an Orchid Plant develop. Once the Orchid buds appear, try to keep the temperature constant or the buds may fall off. HUMIDITY: High humidity, 50% or better, is essential for an Orchid Plant. Setting an Orchid Plant in a stand and placing the stand in a tray filled with pebbles and water helps to increase the humidity. Be sure the Orchid Plant container never sits directly in the water. FLOWERING: Orchid Plants usually flower from December-May. The flowers on an Orchid Plant often last several months. The spectacular flowers of an Orchid Plant can be as small as 1" or as large as 5" depending upon the variety. Try not to get water on the flowers. PESTS: Orchid Plants are prone to Aphids, mealybugs, scale, and spider mites. A good way to prevent insect infestations and diseases is to place an Orchid Plant where it gets a breeze or is near a small fan. The slight breeze also encourages blooms to develop faster on an Orchid Plant. The best ways to treat any insects or pest s that you find on your Orchid Plant is to dab them off with a Qtip dipped in alcohol or wipe them off with a soft cloth dipped in soapy water. DISEASES: Orchid Plant are prone to viruses, bacterial infections, and fungal infections. Increasing the air circulation around an Orchid Plant, as we discussed in the Pest Section is very beneficial in preventing Orchid Plant diseases. SOIL: Orchid Plants require a special soil and should never be planted in regular potting soil. Use a bark-based or peat based soil that retains water but still drains well for all of your Orchid Plants. Orchid Plant soil should contain bark, sphagnum moss, and perlite. There are several commercial soils that are specifically for Orchid Plants.